Shock2k wrote: Go Gunners... That is all. Are you sayin that cause your an Arsenal supporter or cause you don't want someone else to win. I want Arsenal to get 4th just cause one of the Spurs supporters at the pub I go to is a loudmouth deplorable F head and I wish him harm. InSuarezWeTrust wrote: I want Arsenal to get 4th just cause one of the Spurs supporters at the pub I go to is a loudmouth deplorable F head and I wish him harm. At first I thought you were talking about Hawkspur, but then I remember he's not much of a loudmouth and he's not that deplorable. 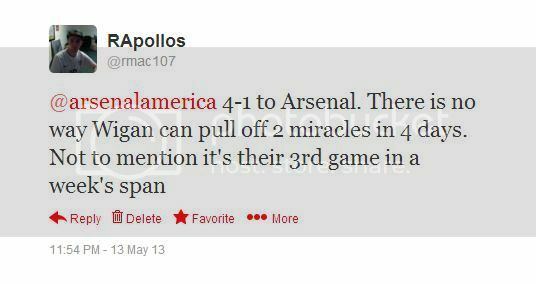 I may sound a bit arrogant about this but here are 3 tweets I made before yesterday's Arsenal-Wigan match, predicting the outcome. 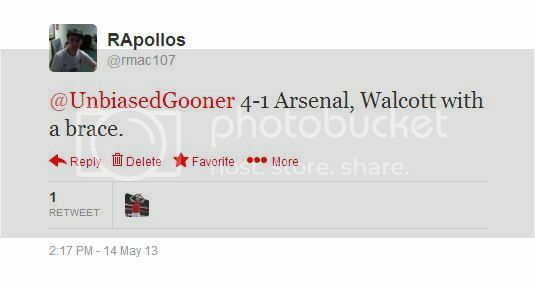 Almost perfect except that Podolski had a brace and not Walcott. I should have placed a bet on this game. This is for ISWT and Si, do you agree? is it august, 2013 yet? Uncle Si wrote: is it august, 2013 yet? I bet QPR fans are saying the same thing as well, though for a different reason. Didn't see the majority of the Arsenal match due to freaking work but heard they weren't very convincing. Which seems to be implanted with Arsenal everytime they win 1-0, but everyone else gets a free pass and a "gutsy and strong performance" comment. But who cares, Arsenal will be in the CL for the 16th consecutive season and Spurs might have just seen the last of Gareth Bale because of it. Oh, Newcastle. Why must you be show crap? peachesenregalia wrote: Jordan Ibe sighting! Played quite well for his debut! I really like our attacking player situation for next year outside of Downing. I really really hate Arsenal because of you, Gate. I hope you're happy. peachesenregalia wrote: I really really hate Arsenal because of you, Gate. I hope you're happy. You really have to ask that? Of course I'm happy. But really? I'm the reason you hate Arsenal? I find that hard to believe that someone will hate a sports team because of a single fan of the team. up until a couple of years ago, I'd have thought the same thing. But seriously, don't hate the club, just hate me. That sounds stupid but it's only fair. There is one guy at my local pub for my entire hatred of Gareth Bale FC (spurs) When both LFC and Spurs happen to be on, and his game is boring one way or the other, he will come give you crap for no real reason without reason. What an F head. Okay I suppose now is as good a time as any for everyone to give their final thoughts and reviews of their clubs seasons and probably even give out a Final Grade for their clubs. And if you want give out your grades for other clubs, go right ahead, no one's stopping you. Liverpool did exactly what I thought they would do this year. Finish 6-10 in the league, gut the squad and implement a new mentality. Ended the season relatively strongly. Lost some matches we should have won, won some matches we should have lost, and had a lot of draws. Rodgers improved the attacking/goalscoring immensely, but we were let down by shoddy defense all too often. We brought in some fantastic players in Sturridge and Coutinho, tried out some young lads in Suso, Wisdom and Sterling, all of which look promising. Henderson has improved, which is good. All in all, I'd give Liverpool a solid C+. a little better than expected, the Suarez biting incident of course is a black mark on the season, but there it is. Happy to finish 8th, about where we should be - right behind the "big 7" teams. Season started off great, but figured it would level off. Grade is lowered because we seemed to be on cruise control towards the end of the season. Would have liked to finish with at least 50 points - I know we finished only 1 point shy of that but still disappointed. Amazing season from Romelu Lukaku including his hat trick yesterday. No way Chelsea lets him come back. Highlights were probably the away win at Liverpool, and the first and last matches of the season at home with the 3-0 win over Liverpool and the incredible comeback 5-5 draw vs. Man Utd. Worst match was just last week losing 4-0 at Norwich. Our black mark of the season was the Odemwingie fiasco. Shame because he's my favorite player - met him a couple of years ago, and he was a really nice guy. Unfortunately, don't think he'll be back. I decided to follow QPR when the season started. They get an F------. The whole season sucked. SeatownJay wrote: I decided to follow QPR when the season started. They get an F------. The whole season sucked. Curious, how did QPR become your team? Probably for the same reason's most people decided to support Man City, Chelsea and PSG. Dunno, something about them struck my fancy when I read stories about them when they were promoted to the PL after the 10-11 season. I knew they weren't that good but I'm a sucker for the underdog story. Kolo Toure looks like he is on his way to Liverpool on a free transfer according to multiple reports. Gotta say I like the move. Guy leaving a comfy seat, a huge weekly paycheck, and some champions league football prestige to go to a team on the rise and become a part of something special. Agree. He's getting on a bit, but will fill the Carragher role of being a veteran leader and a very competant defender. Landing him on a free is a great move. Tony Pulis has decided to quit Stoke City. This means that Alan Pardew has now become the second longest serving EPL manager at 2 years, 163 days. After him comes Sam Allardyce, Martin Jol and Brendan Rodgers. Yep. All 91 other football league clubs have had a manager change since Arsenal last won a trophy. At the beginning of the season, I had felt Arsenal had the kind of squad that could sneak into 2nd place. Sadly it was the bare minimum again for the Gunners. 16 years straight of qualifying for the Champions League is great and all but a trophy would’ve been a nice add on, oh well, take what you can get I suppose. I think it’s safe to say that this squad proved they don’t need RvP to get results, though probably need a little more help to push forward more. I feel after rethinking it that Arsenal’s early season struggle was due to adjusting to life without Van Persie and Song. Once they got things situated, a little later than I would’ve liked, things just clicked. Not sure how he did it, but Wenger again found diamonds in the rough. Podolski was a great threat when he was in form, Giroud took a bit but when he finally hit the ground running, he proved just how good he can be. Then there’s Cazorla, the man who was criminally left off the PFA’s Team of the Year, sure he had his problems against top clubs, but he was virtually unstoppable at times when we needed him to. Monreal is still probably considered a panic transfer when Gibbs ended up hurt, but he was fantastic when we used him, far better than Santos by a country mile. As for who left, Van Persie was the one that stands out the most. Alex Song, not so much, the whole “worst La Liga transfer signing” thing shows how much. Some of the players who were loaned out, particularly Bendtner, I still question why we still pay their Wages to go elsewhere. At times this season I have thought that it was time for Wenger to call it a career. He’s blatantly obvious stubbornness towards adapting and Arsenal never appearing to have a Plan B was increasingly frustrating at times. Also his late decisions with substitutions have cost Arsenal points in a couple key matches. But at the end of the day he did make some good calls and they paid off in the long run. For him, next season is make or break for him, if we don’t win a trophy then he has to pass the torch and retire. Like I said, I was hoping for 2nd place, but we got 4th. The team is getting criticized for their celebrations at the end of the season finale, some people claiming that it shows the team’s ambitions and priorities have dipped. I look at it like this: If this is how we celebrate 4th place, imagine how we’ll celebrate a trophy. That aside, I’d say this club performed better than they did last season. Sure 4th place is a worse finish than last season’s 3rd. But looking deeper into it, you see that Arsenal finished with 3 more points, a better Goal Differential, conceded 12 less goals(I wonder what the look on everyone's face is like when they realize Arsenal had the 2nd best defensive record), and scored virtually the same amount of goals as last season(Ended up the EPL's 3rd highest scoring team). I feel the Gunners got a good return for our 3 summer signings. And despite a slow start, the finish shows some promise for next season. Arsenal’s summer could be better than it’s been the past couple years with no one aside from deadwood players expected to leave. To be brutally honest, the final grade was gonna be a B or a C depending on if Arsenal won against Newcastle. Gatehawk wrote: At the beginning of the season, I had felt Arsenal had the kind of squad that could sneak into 2nd place. Sadly it was the bare minimum again for the Gunners. 16 years straight of qualifying for the Champions League is great and all but a trophy would’ve been a nice add on, oh well, take what you can get I suppose. youre squad needs a C and your manager an A-. Arsenal closed out the season a remarkable 29 points of 33, in which one, literally, one, slip up costs the team a CL spot. Thats your manager Gate. Yes he toys with his lineup a bit, and yes he makes some rash decisions late on. But he's lost Fabregas, Song, Nasri and now RvP and still managed the same bit, and did so with what I think are only slightly above mediocre players (in players like Podolski, your back 4, your Cms without Wilshere). Arguably one of my top 3 managers of the year. peachesenregalia wrote: Liverpool did exactly what I thought they would do this year. Finish 6-10 in the league, gut the squad and implement a new mentality. Ended the season relatively strongly. Lost some matches we should have won, won some matches we should have lost, and had a lot of draws. Rodgers improved the attacking/goalscoring immensely, but we were let down by shoddy defense all too often. We brought in some fantastic players in Sturridge and Coutinho, tried out some young lads in Suso, Wisdom and Sterling, all of which look promising. Henderson has improved, which is good. Overall, the season for me is a B. Thats including the natural shaky period that came with yet another managerial change and again a summer window that saw more players leave then come in. The fact the squad gave up only 5 more goals than champs United on the season, scored a heap load more than last year (most in the PL since January), adopted BR, while he adapted to them sells hope for the next few years. The summer is massive. I'm not against Toure coming in, but he better only be a replacement for Carragher. This team needs a new CB to start alongside Agger. Uncle Si wrote: youre squad needs a C and your manager an A-. Actually, when I said B-, I meant it's a boarderline B-/B, And if I did grade each manager, Wenger would've had the 3rd highest grade, behind Fergie and Laudrup, and just ahead of Benitez. The squad, it was the fact that they did get progressively better as the season continued, though they were tightrope walking between a B and a C+ towards the end in my mind. "Actually"? Just say what you mean next time. He's either/or. You went as far as saying he should retire next season if they are trophyless... why? He's continued to be successful (enough) with a B- squad. Why is it on him? Uncle Si wrote: "Actually"? Just say what you mean next time. He's either/or. You went as far as saying he should retire next season if they are trophyless... why? He's continued to be successful (enough) with a B- squad. Why is it on him? I say that because he can only take the team so far. And it might just become too stressful with the increasing frustration of the fans. I also said he should retire if next season ends as another trophyless one because it is his last contracted season with Arsenal, unless we get closer to ending the trophy drought without actually winning one. Plus I never said he has to leave Arsenal, I've always felt that if he calls it a career he should stay with the club in a different job. Last edited by Gatehawk on Wed May 22, 2013 11:01 pm, edited 1 time in total. I would like to do a long winded season report card of Liverpool, but it's already been said. Onward and upward! Edit - Also Stoke City Rugby team can eat 1000 dicks. Relegation was never more deserved. Cardiff, Hull, and Crystal Palace officially replace QPR, Reading, and Wigan as the new premier league punching bags. Anyone back any of the new boys to stay up? I reckon Cardiff could maybe avoid the drop. InSuarezWeTrust wrote: Cardiff, Hull, and Crystal Palace officially replace QPR, Reading, and Wigan as the new premier league punching bags. Anyone back any of the new boys to stay up? I reckon Cardiff could maybe avoid the drop. I've always had a bit of a soft spot for Crystal Palace. They were a mainstay in the old first division, and had to suffer through having Ian 'Quasimodo' Dowie as their manager. I hope Cardiff stay up for the sole reason of Craig Bellamy. I have no feelings towards Hull, but Crystal Palace has some F ugly kits. Hard to even look at. Palace fan here and was at the play off final yesterday with the kids. Great day and financially secure for a few years, could get a few spankings next season though I fear! InSuarezWeTrust wrote: I hope Cardiff stay up for the sole reason of Craig Bellamy. I have no feelings towards Hull, but Crystal Palace has some F ugly kits. Hard to even look at. Don't worry, we (Palace) have new kits for next season! The away kit looks pretty cool. Yeah the away top is the better of the two.